It’s one of the most common questions that people ask. 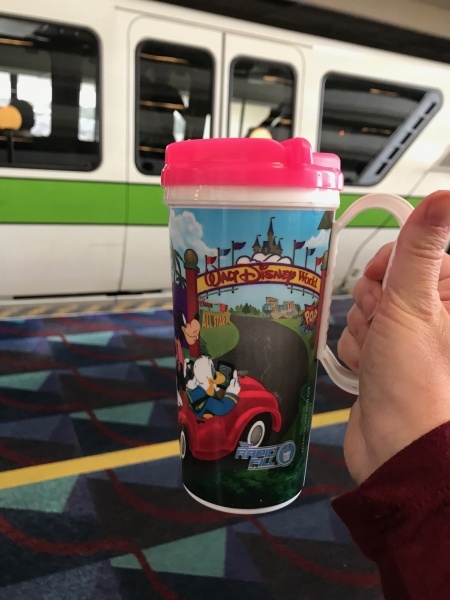 Is the Rapid Fill Refillable Mug sold at Walt Disney World resort hotels a good deal or not? Well, for some the answer to that question is easy because the mug is already included in their Disney Dining Plan package. But for those who have to pay out of pocket for the mug, that question gets a little more ambiguous. Today, I’m here to answer those burning questions you may have about the Rapid Fill Refillable Mug system. The Rapid Fill Refillable Mug is a hard plastic mug that can be found at Walt Disney World resort hotels. They come with a cute outside design and many different colors, which can be helpful if the whole family has a mug to let everyone know who’s mug is who’s. Each mug contains an RFID (radio frequency identification) chip in the bottom of the cup. This is very important to know….more on that in a second. One thing to note when purchasing your mug: They are activated for use for a full calendar day, not based off a 24 hour period. This means that if you bought your mug at 10:00 p.m. and used it, the first use day will end at 11:59 p.m. that evening, not really giving you the full value of your mug. What Beverages Are Included with a Refillable Mug Purchase? Guests can use the Rapid Fill Refillable Mug for about 14 oz of soda, hot chocolate, hot tea, iced tea, and coffee. Soda options include Coke, Diet Coke, Coke Zero Sugar, Sprite, Fanta Orange, Barq’s Root Beer, and Minute Maid Lemonade. Of course, options change, so do keep that in mind and make sure to look at the offerings before purchasing the mug to make sure what you really want is indeed being offered. How Much Do Mugs Cost? The cost of a Rapid Fill Refillable Mug is $18.99, plus tax and Disney says these mugs are valid for the entire length of your stay, up to 14 days. The price is the same whether you are staying for 2 days or if you are staying at the resort for 14. Those Guests who have purchased a Disney Dining Plan will receive a Refillable Mug that is included with the price of the dining plan. Where Can I Purchase and Use the Refillable Mugs? These mugs and refill stations can be found in the food courts of most resorts. Some resorts do not have a food court, so these mugs are also available at select quick service restaurants, pool bars or other locations. At select resorts, there may be more than one Refillable Mug Refill Station. What are the Refillable Mug Refill Stations? Once your mug has been activated, Guests should head to the refillable mug self-service beverage station. 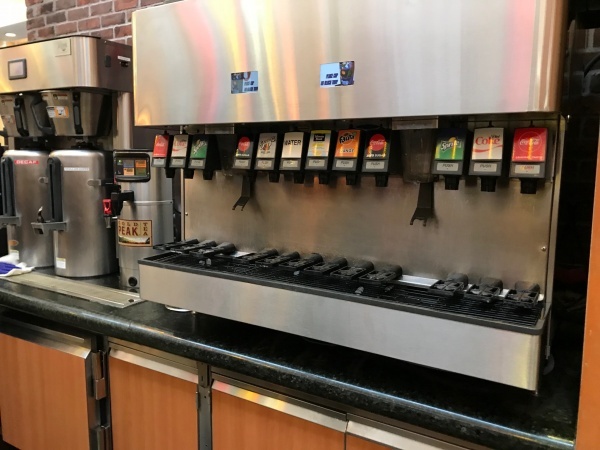 Here, Guests will need to place their Rapid Fill Refillable Mug on the hard plastic tray that is located on the beverage station underneath the beverage they are looking to consume. Doing this allows the soda machine to read the RFID chip that is located in the bottom of the mug. The soda dispenser allows you to fill your mug up one full pour. Once the mug has reached its capacity, the dispenser’s screen will alert the guest with a message that says the fill is complete. If you want to refill your cup immediately, you must wait for 2 minutes to refill the same mug. You will not be allowed to refill before that period and you will be alerted to how much time remains until your next refill is available. In addition, guests can also choose to refill their mug with coffee, hot tea, hot cocoa and iced tea. 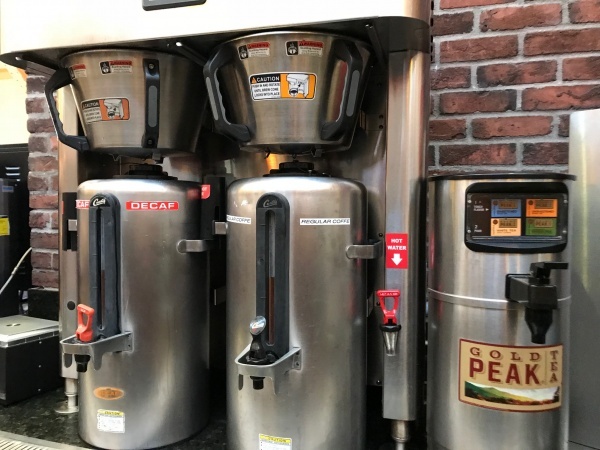 Refills of coffee, hot tea, hot cocoa and iced tea are not dispensed via the Rapid Fill system and instead can be filled from pots and machines next to the soda dispensers. Do I Have to be Staying at a Walt Disney World Resort to Purchase a Mug? Rapid Fill Refillable Mugs can actually be purchased by anyone, not just Disney Resort Hotel Guests. So, feel free to purchase one, if you think you’ll use it. Can I Only Use the Mug at the Resort I Purchased at One Resort at Another Walt Disney World Resort Hotel I’m Not Staying at? Yes! 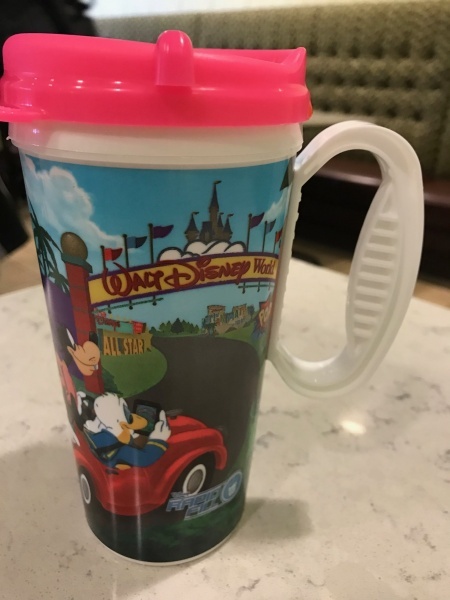 You can use your Rapid Fill Refillable Mug at any Walt Disney World Resort Hotel! Not just at the hotel you purchased the mug at. For example, I bought my mug at Disney’s Grand Floridan Resort, but made a trip over to Disney’s Contemporary Resort and was able to fill it up at both resorts! 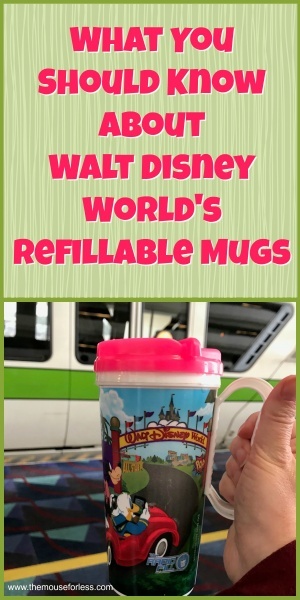 Can I use the Resort Refillable Mug at the Theme Parks? Plain and simple answer – no. The resort refillable mugs are not able to be refilled in the theme parks or at the water parks. Are the Mugs Microwavable and Dishwasher Safe? Thanks to the RFID chip found in the bottom of the mug, they are not microwavable. Don’t put it in the microwave unless you’d like to set the place on fire! The mugs are dishwasher safe though. Can I Bring the Mug Back on my Next Trip and Still Receive Refills? While the answer to this question at one time might have been different, the answer now is a clear hard no. The beverage stations won’t refill anything without an active RFID chip, which technically expires 14 days after purchasing the mug. 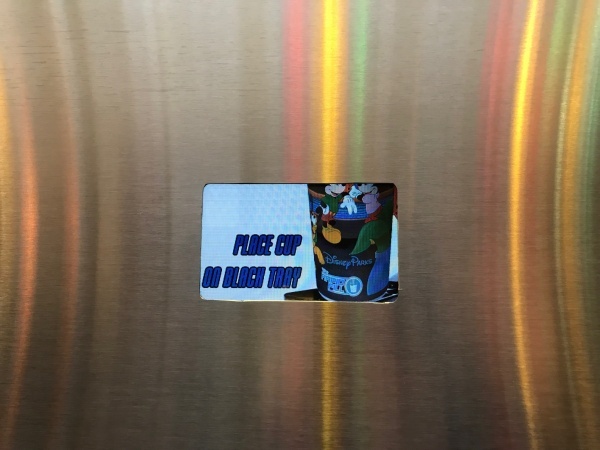 If you do have an older Rapid Fill mug (with a RFID chip) from the previous year, you can bring it back and activate it for your current resort stay. You will not receive a discount, however, for reusing your older mug. If you plan on purchasing beverages 6 times overall throughout your trip, a refillable mug may be in your best interest. Clearly, the more days you stay and the more stops at the fountain you make, the better your value is. I personally found have found that the value was there, plus now I have a great Disney-themed souvenir mug that I get to use at home! Do you typically get a refillable mug or skip them? Have questions about this program? Share your thoughts in the comments. 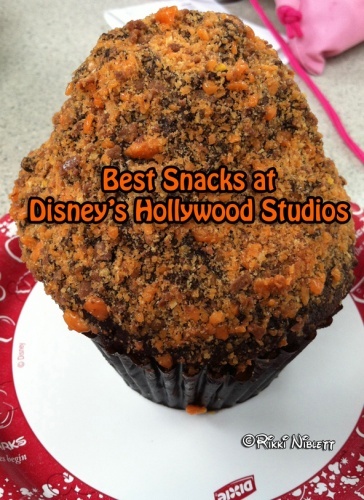 I always get one (actually two because my granddaughter comes with me) whether I get the Disney Dining Plan or not. If you’re a coffee or soda drinker, it more than pays for itself. Not so much if you only drink water. And because the drinks are free, my granddaughter can take it to the snack place and fill hers up without worrying about needing to take money with her. And like you said, it makes a nice souvenir. My granddaughter is drinking from the one we got last year when we went as I type this. The cups we got the year before that, I gave to my grandsons who couldn’t go with us. We still have the cups from our trip back in 2013. You made this year but forget to put the updates. You can use the mugs for alcohol and specialty drinks now. Hi Kayla! While the 2018 Disney Dining Plan does allow for alcohol and specialty drinks, you cannot use the Refillable Mugs for those two types of beverages. Only the beverages listed can be used inside the Refillable Mugs. We went to Disney at the end of January this year. We went to Be our Guest for breakfast and it was very good. Also went to Sanaii for dinner and Trails end at Fort Wilderness lodge. It was a buffet and also good. Is there a limit to the amount of refills you can get in one 24 hour period? With the refilable mugs, there is no limit to the amount of refills you can get in a 24 hour period. It’s all you can drink. With the refillable mugs, there is no limit to the amount of refills you can get in a 24 hour period. It’s all you can drink. Does anyone know if or when the design on the Disney Rapid-refill resort mugs will change again? If I have to buy new ones every year I’d like to see a different design on them them. They use to change every couple of years, but this mug has been the same for way too long. Anyone heard if they might change design again anytime soon? We don’t know when they will be changing the refillable mugs. But as someone who collects them, I look forward to when they do! We are doing a split stay and only getting the dining plan for the first 3 nights of our 7 night stay. Can we still use the mugs for the remaining 4 nights we are staying on property but don’t have the dining plan? Basically the plan says we only have the mug for the stay of our dining plan so it is confusing. Question – I’m doing a split stay. One night BWV, then over to BCV. If I add dining plan for the one night, will the mug still work for remainder of the trip (5 days). You indicated it’s good for 14 days and then say it’s good for length of stay. Trying to crunch numbers to see if one night of DDP will be cost effective for us or not. Do you know if we can use the mugs when we get out Quick Serve meals or Snacks instead of getting them in a disposable cup? I hate the waste of a disposable cup if I can avoid it! Do you mean just in general or if you are on the dining plan? If you mean while on the dining plan, you can of course use your mug instead of a paper cup, if you would like. However, you would still be eligible to get another drink, if you wanted. If you mean just in general, if you buy a refillable mug, you can absolutely use it instead of a paper cup to refill your drink throughout your trip. some pictures i see show handles and some do not. i heard newer ones did not have handles. can you confirm this? also do you know what colors are available? it is hard to tell from google pictures since most of them show cups with handles. Hello! Disney tested not having handles on their mugs for only a few weeks about a year ago. They have since gone back to selling mugs with handles once again. As far as colors, they tend to vary. Lately I’ve seen teal, pink, purple, yellow, red, and blue. Typically they’ll have at least 3 different colors available, at minimum. Are you able to mix your sodas in one pour (I’m one of the weird ones that like to mix them ?)? Or can you only do one type of drink at one time. Question- On our 12 day trip in November, we KNOW the mug will be worth it for us. However, in the article, you describe the coffee/tea options as not being affiliated with RFID technology. Are those products served from more traditional canisters as one might encounter at a buffet or a convenience store? Still self serve, but with no computerized time limit? Since I plan to mainly use my mug for getting caffeine, I’m curious about how those drinks differ from the sodas?? Thanks for the kind words about the podcast! So, yes, the coffee can be found in their own traditional canisters, much like you would see in a convenience store. So you can serve yourself all you want, with no time limit. I only have the dining plan for the second half of my stay but I am staying at a Disney resort for my entire trip. Since I am technically “checked in” online for the second part of my stay too, can I get my mug and start to use it before actually being at the second hotel won’t the dining plan as long as it doesn’t exceed 14 days? You will only be eligible to use the refillable mug that comes with your Disney Dining Plan during the time when you actually have the Disney Dining Plan, so it would only be available for the second half of your stay. If you wanted a refillable mug for the first half, I believe you would have to buy a separate mug. Hello! I feel like I’ve read somewhere that hot chocolate does not work with the refillable mugs. Since this article was written in January, I’m wondering if you know if things have changed? I have not heard about the removal of hot chocolate as an option for refillable mugs. Hello! Your blog says that the mugs cannot be refilled at the theme parks, but for one of the comments you have mentioned that you can get it filled at a quick service counter. I am a bit confused. Can you please help me understand. Thank you. Mugs can be refilled at quick service restaurants in the resorts. However, Refillable Mugs cannot be refilled in any of the in park quick service dining locations. You get the refillable mug with dining plan. Which is good for up to 14 days after your stay at a WDW resort. So if you stay at a resort the first 3nights , you can go back to a resort and fill your mug. Your dinning plan mug can not be used in the park. So does the park offer a refillable mug? The entire mug thing is just confusing and WDW guest feel ripped off because it just is NOT clear. Let me help you understand and hopefully simplify things. If we’re being technical, yes, if you stayed for only 3 nights, the mug would still be good for up to 11 days after. The parks do not offer a refillable mug option. You cannot use the mug that comes with the dining plan in the parks for drink refills. The mugs are for resort use only. Please let me know if you have further questions and I’ll be glad to help! The mugs can be a great value, even with some of their limitations. Just depends on how you end up using them. Do they sell refillable mugs in the theme parks? If so, how much are they and can you use them at multiple parks? Thanks. Debi, Unfortunately they do not sell refillable mugs in the parks. They are only sold and able to be used at the resort hotels. Can you bring your refillable mug if you are having dinner at any sit down restaurant in any of the resort restaurants? If I am having dinner in a sit down restaurant in one of the resorts can I use a refillable mug. I will not have a dining plan. Hello Mary! The resort refillable mug does not work at the sit down restaurants at Walt Disney World, meaning you can’t use that instead of ordering a soda or coffee. There is nowhere for the Cast Members to refill them. Hi there, thanks for all of the helpful info!! We are heading to Disney for our first time on tues. and looking for all of the tips we can get! Can we use our refillable mugs (have dining plan) for water in the theme parks?? For example, can we use the water function on the soda machines to get water at the parks or solely at the resort areas? What do we do if we want some water while out and about. We are not soda drinkers, just looking for some water. If we can’t use the mugs, how do we get a drink of water at the theme parks?? Thanks!!! Unfortunately, the water parks don’t allow Guests to use the refillable mugs that are sold at the resorts. However, if you are wanting water while in the theme parks or at the water parks, all you have to do is ask at a counter service restaurant and they will be happy to provide free cups of water! While I don’t drink tea…I think I’ve seen containers for both. “Each Guest ages 3 and over will receive a refillable drink mug, which is eligible for refills at self-service beverage islands at Quick-Service locations at any Disney Resort hotel. 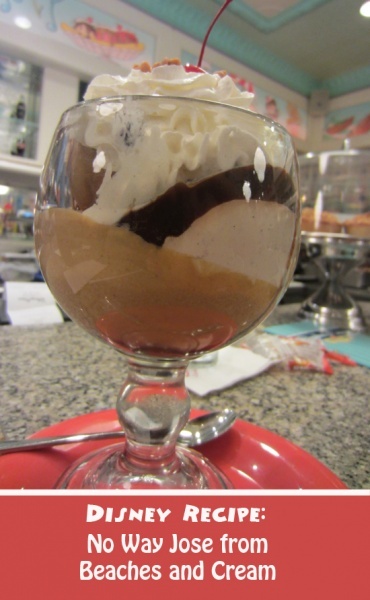 Guests ages 3 to 9 must order from a children’s menu, where available. Does this mean that the refillable cups are now allowed to be filled with alcoholic beverages? Or is this just referring to QS or TS meals? No. You cannot use the refillable mugs for alcohol. They can only be used at the beverage stations and the beverage stations don’t offer alcoholic options.